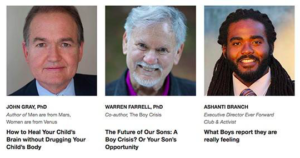 TEDxMarin SALON (Marin County’s local TED Chapter) is taking a deeper dive into our next generation of Boys. They will discuss RESEARCH from the new book The Boy Crisis, covering a span of 11 years and 63 developed countries. It reveals that boys (compared to girls) are falling behind all over the world in social development, math and science, why they are far more prone to violence, bad behavior and suicide, how this connects to the #metoo movement and global terrorism, and most importantly, what we might all do about it. We have been given a special discount code for anyone wanting to attend. Ashanti Branch. Educator, activist and speaker featured in the award winning film The Masks We Live In.